Learn more about this talented poet. Mary Pinkoski has walked a journey of discovery and rediscovery. 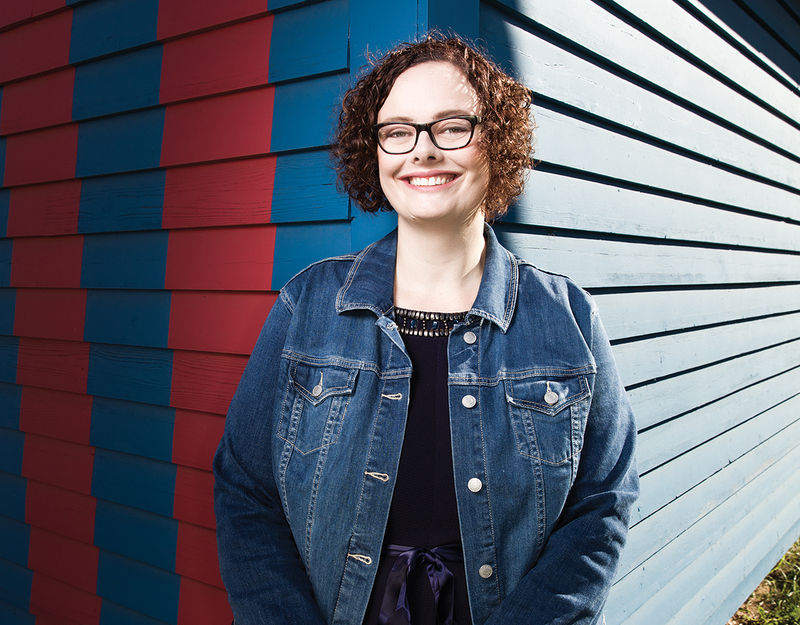 She’s an alumna of the Top 40 Under 40 for all the work she did as Edmonton’s Poet Laureate and her work within education. It’s been three years since her position with the city ended; now she’s working hard on a new area of writing, completing her doctorate in Education and rediscovering her poetic voice – all while helping youth find their own voice through YouthWrite’s summer writing camps. Q: What was it about poetry that drew you in as a writer? A: For me, in particular, spoken-word poetry allowed me to be able to tell stories that maybe I didn’t tell in regular conversation or things that were important to me. It was almost like another way of talking and having dialogue and being able to express those things that were important. It’s funny because, right now, I feel like I’m shifting away from poetry, but, even in my shifting away, I still seem to be kind of working with these forms that have elements of the poetic or allow for elements of the poetic. The big draw that poetry holds for me, in terms of it as an art form, I guess, is the malleability of metaphor and how a small container can hold such a large metaphor, also that idea of writing a very condensed piece that’s able to convey a large message. The spoken-word stuff, the performative aspect, was also something I enjoyed. I think being able to perform has a draw to me as well, being able to make that connection with the audience almost immediately. Q: You mentioned that you feel yourself shifting away from poetry. What do you feel yourself shifting towards and why? A: Yeah, so I’m in my PhD right now and my research is on museums … I have noticed that I’m shifting a bit towards creative non-fiction almost. I’ll write these little creative museum pieces that sort of fit outside my PhD work… They’re just small little segments, but kind of a new way of looking at material and dealing with academic research and theoretical material and blending that into the creative. Still, also again, I find it’s very much rooted in the idea to express myself creatively and the need to do that even in an academic format. A: There’s something about it that’s really neat because I think it holds poetry quite well but then also allows you to work with academic quotes or research or something and meld the two together, which I’m really enjoying and experimenting around with. Q: What was your motivation initially and how has it changed over the years? A: I would say in the beginning it was about using poetry as a way to tell the stories that were important to me and then what really shifted my motivation is when I became poet laureate for the City, because the writing turned into the voice of the city, so what I was writing for two years was basically the voice of Edmonton, telling Edmonton’s history and reflecting on the good places within that history and the challenges in that history, really trying to understand how to create a poem that honours the voices that I don’t represent. My motivation became much more public-facing. After the city it’s almost like I’ve went back to the beginning to find my voice again, it’s been three years and it’s been an interesting process… to come back into myself through my writing. This article appears in the November 2018 issue of Avenue Edmonton. Subscribe here.